Allerton CE Primary School come out on top! 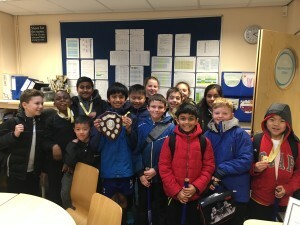 The Hockey team went unbeaten in the Active Schools Hockey Festival held at Weetwood Sports Centre. After a slow start the team soon found their stride and beat every team that stood in their way. After a tough morining of 7 games in which the team were unbeaten they then progressed in to the semi-final against Alwoodley Primary School who they beat 5-3. By this point the team were full of confidence and went in to the final with only one thing on their mind and that was to win the match and retain the title- and that they did. The team will now go on to represent Leeds at the West Yorkshire Games on Saturday 25th March 2017. This entry was posted in 2016-17, Hockey by Mr P Magnall. Bookmark the permalink.